Here Sunday night is upon us again and I haven’t really done any craft this week. However yesterday I did take my Mum (who is keen patchworker/quilter) to a local fabric shop that she had no idea existed. Quilters Quest is a real treasure trove of everything patchwork related, the floors right up to the ceilings were filled with all sorts of fabrics, batting, threads and books. The photo is taken from their Facebook page as I forgot my camera. So me, my Mum and the 2 girls thought lets go early before it gets busy (it opens 9:45am) so we turned up at 10am and were quite shocked to see that the place was packed. A bus load of about 30 women had turned up to feed their passion for all things patchwork. On speaking to some of them I heard that some of them had travelled quite a distance to be there. It’s such a great shop and there are not many places like it there so I can see why it’s very popular. They also have a shop online and also hold classes in store so if you get a chance visit them online (or if you’re in Belfast call in person). On another note we had lots of DIY work done in my house this weekend, leaky radiators replaced and a dishwasher plumbed in. On the plus side as the tools were all out I got one of my favourite pieces of art put up on the wall. This is something we commissioned last year. 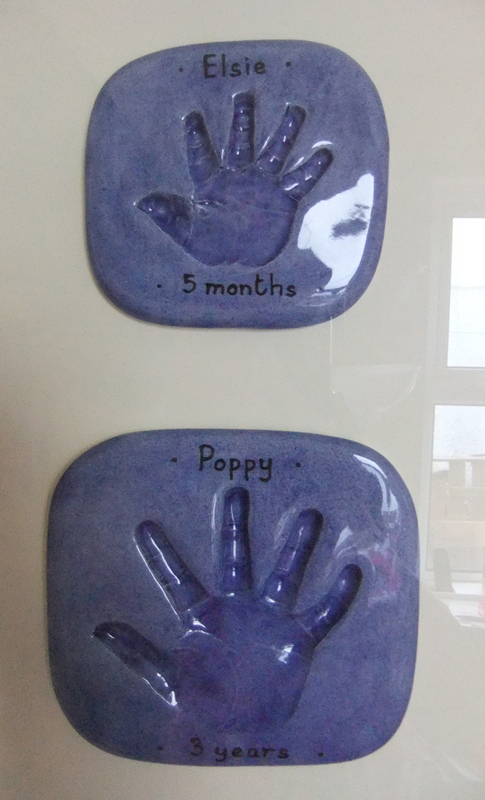 It’s of our hand imprints captured in clay which is fired, glazed then mounted behind glass in a deep wooden frame. My husband was recovering from Chemotherapy and I wanted a permanent reminder of us as a family at this time as Elsie was still very young. So as you can see little Elsie’s hand print is at the top (aged 5 months), Poppy is below that (aged 3 years), then me and Hubby. A close up of my little ones hands. So after 11 months the hand prints are finally on show in the hall for all who visit to see. Has anyone else done something similar, do you have any great keepsake ideas for children? Ooooo that shop looks great. Whenever I am away anywhere I always seek out local fabric/yarn/craft shops. Lovely family piece of art too. You can get almost any craft thing online nowadays but nothing is as good as visiting a craft shop in person. It’s such a shame that there aren’t too many near me. Thank you-it should look good…it cost enough 🙂 Well I blame it on post pregnancy hormones +being all emotional about Steve. However I’m glad we did it as it’s lovely to look at. Those hand prints are delightful! Beautiful piece of artwork, and totally unique. The hand prints are beautiful!! Love the color and the idea.